Dubai: The Dubai Metro has made it to the Guinness Book of World Records, as the longest driverless metro network in the world, spanning 74.695 kilometers, officials announced on Tuesday. The record has been set taking into account the combined length of the metro's Green and Red Lines. The achievement is an addition to the one already made by the Dubai Metro Red Line in September 2011, when it set a new record as the longest driverless metro line in the world at 52 km. Mattar Al Tayer, Chairman of the Board and Executive Director of the Roads and Transport Authority (RTA), received the Guinness Certificate from Talal Omar, Regional Director of Guinness Book of World Records in the Middle East, at the RTA headquarters on Monday. Al Tayer dedicated the achievement to His Highness Shaikh Mohammad Bin Rashid Al Maktoum, Vice-President and Prime Minister of the UAE and Ruler of Dubai, who is the driving force of the Dubai Metro project. "The implementation of the Dubai Metro project is a true testament to the vision of Shaikh Mohammed in uplifting the infrastructure of Dubai. He has been closely monitoring and directing all phases of the work progress in the project, and endorsed the suitable route from several alternatives presented," he said. "He envisioned using the metro as a backbone linking various parts of Dubai city enabling commuters smooth mobility while enjoying a panoramic view of the city's landmarks," he said. Parts of the track have been selected to be underground and others elevated to support this vision and to suit the urban layout of Dubai. 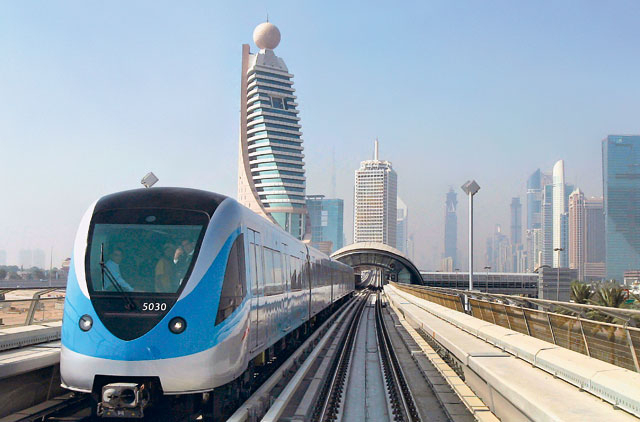 Shaikh Mohammad aimed to make the Dubai Metro the best in the world, since its inception. Cutting-edge technology in the rail industry was used, including an air-conditioning system in stations and trains. All trains are operated by an integrated electronic system enabling the exercising of enhanced control and setting trip timings in a highly accurate format. The metro stations feature a creative and distinctive architectural design pattern, and are been fitted with the latest safety and security techniques. Parking lots have been allocated for private vehicles and public buses in each station, he said. The total length of the Green and Red Lines add up to 74.694 km, of which 52 km are on the Red Line, and 22.694 km are on the Green Line. The metro has a total of 47 stations of which 29 stations are on the Red Line and 18 stations are on the Green Line. The two lines intersect twice; first at the Union Station which is the biggest underground metro station in the world spanning an area of 25,000 square meters, and second at Khalid Bin Al Waleed Station; which is one of the most stunning metro stations in the world, thus enabling users smooth transfer between the two lines through these two stations.